...that's good enough for me! Oh man, I think my brain is about to explode ...yet I just took another bite. I cant remember the last time i ate something this chocolatey. Weeeeeeee! round and round the brain goes. 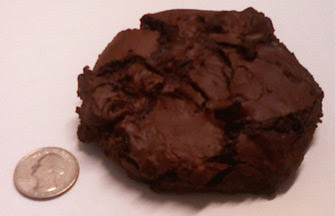 It's a giant, thick, chocolate cookie that melts in your mouth as you eat it. Tastes like your eating melted chocolate chips. One of the benefits of having a company meeting at lunch time. Most of the cookies were regular chocolate chip, but I snagged the last chocolate chocolate chip one.